We may have 4 practices, but we have 1 aim: providing your pet with everything they need to live a longer, healthier and happier life. Distinguished Vet and Principle of Stanhope Park Veterinary Hospital, Micaela Wright is passionate about all things animal related. She had dreamt of nothing but becoming a vet since the age of 5. 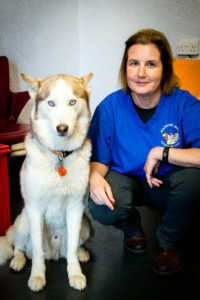 Micaela qualified as a vet in 1994 and became a partner of the hospital in 1999. In 2004 she successfully opened the Middleton-St-George practice. Micaela became the principle in 2009 and together with her team, opened the Yarm practice in 2010. Being passionate about providing the best possible care for their patients, Micaela and the team have most recently opened the new Cats and Exotics Clinic around the corner from Stanhope Road on Duke Street, in October 2016. Micaela and her exceptional team are accredited members of the Royal College of Veterinary Surgeons Practice Standards Scheme. Together they have achieved hospital status which is the highest standard a practice can reach. Meeting such high standards requires a very stringent inspection. This looks at all aspects of the practice, including hygiene, facilities, health and safety, laboratory facilities, equipment, emergency cover, and staff training. If your pet requires specialised medical attention that our smaller practices cannot accommodate, we have a dedicated ambulance service which will safely transport them to our Stanhope Road branch, free of charge. We also provide our own out-of-hours emergency service, 24 hours a day, 7 days a week, from our Stanhope Road Hospital, so you can rest assured that should an emergency occur, you will still see a familiar face who has access to your pet’s medical history. Your pet will receive the ultimate package of healthcare whilst being a patient at Stanhope Park Veterinary Hospital. We have treated all types of animals from dogs, cats, rabbits, and guinea pigs to chinchillas, rats, mice, reptiles and other exotic animals. To register your pet, or to book an appointment with a member of our veterinary team please call 01325 380111 or email Stanhope Park Veterinary Hospital at info@stanhope-vet.co.uk.